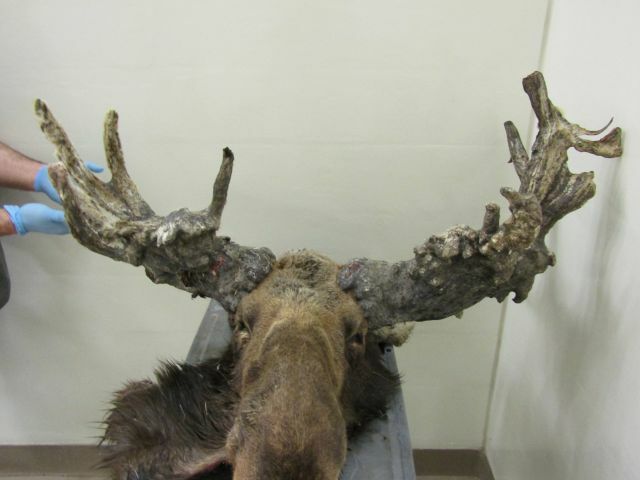 In early April 2017, Conservation Officers in southeastern Saskatchewan were notified of a dead moose with grossly deformed antlers. The moose was collected and submitted to the CWHC diagnostic lab in Saskatoon, SK. At autopsy the moose was estimated to be approximately 10 years old. It had moderate hair loss and had numerous ticks on and embedded in the skin. The animal was severely emaciated and anemic which was determined to be the cause of death. The antlers were severely deformed with thick beams and irregular points (see photo). There were a couple of undulating transverse lines on the beams where it appeared the antlers had failed to shed in previous years. Remnants of velvet were still present on the surface of the antlers. Both testicles were retained in the abdomen (cryptorchidism) of the moose and both were fibrotic and enlarged, the left more so than the right. On examination of the testes with light microscopy it was determined that they were neoplastic and a diagnosis of Sertoli cell tumor was made. Sertoli cell tumors have been reported in other species, especially dogs, and can cause a feminizing condition because of the abnormal secretions by the neoplastic cells of the hormones estrogen and inhibin. The excessive production of estrogen is the most likely explanation for the abnormal antler growth and failure of antlers to be shed. Moose that are castrated will develop similar deformed antlers which are never shed. Contributed by Dr. Trent Bollinger, Regional Director of CWHC Western/Northern.